Visitors of Vienna will soon notice the very high number of palatial, usually Baroque buildings that are labeled with a set of Austrian flags and small plates that provide some information on history and architecture of the building. These city palaces are called "Palais" - there is some controversy about the precise meaning of the word Palais and whether all buildings that are called that way really are proper Palais or not. In the sense of a functional definition, a Palais is simply a city palace of a noble family, usually used as a "platform" for networking and representation near the Emperor and his government. Most Palais of Austria can therefore be found in Vienna - although there are others in the surroundings, like Laxenburg, or different cities like Graz or Innsbruck. The development of the Vienna Palais, however, is distinct and unique. Vienna concentrated people with a keen interest in networking not only from Austria and other countries of the Habsburg Empire, but from all of Europe. Ever since the Renaissance, noble families sent their delegates to Vienna - and they needed a place to stay and a representative venue for receptions and courtly customs. 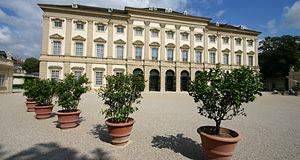 The first Palais in the modern sense of the word developed in the 16th century around today′s Minoritenkirche. The development of the "Garden Palais"
In the 17th century, Palais were built outside the city walls in the suburbs and surrounding villages of Vienna. Since a Palais is by definition not fortified and purely "decorative", the Second Turkish Siege of Vienna in 1683 accounts for the lack of any pre-1683 Palais outside the Ringstraße (which marks the course of the former city walls). After the Turkish defeat and the consolidation of a Catholic Austria, the Habsburg Empire entered its prime era: The economy recovered quickly and the vast lands that the Habsburg armies conquered from the Turks nourished the nobility′s wealth. Especially the high nobility started to build Palais like mad and competed for the fanciest and most exquisite design. The Palais of Rome served as models and the construction boom attracted innumerable craftsmen from Italy. During the peak of Baroque, a standard for the construction of a Palais developed: The front side of a Vienna Palais always faces the road; the façade is often decorated with plaster and ornaments, the entrance gate is round and sometimes extravagantly decorated with references to Classical art. Titans are a common feature at the flanks of the entrance gate. From the main gate you can enter the courtyard, but also a staircase that leads to the main floor - the staircase is a key-feature to every decent Palais. The staircase follows a typical motive of the Baroque: Moving from the dark of the low level on the street to a splendid "beletage", a ball room or a bright reception hall - echoing the journey of life from the dark grounds to a higher, brighter level. At this level, all the "official" things would take place - balls, receptions, concerts. The actual living rooms were on the higher floors and usually much less expensive in their interiors and decorations. The staff lived either on the ground level, the basement or a separate building. Continue with "Palais of Vienna - Part II"